Recall from The Squares of Riemann-Stieltjes Integrable Functions with Increasing Integrators page that if $f$ is a function defined on $[a, b]$ and $\alpha$ is an increasing function on $[a, b]$ then if $f$ is Riemann-Stieltjes integrable with respect to $\alpha$ on $[a, b]$ then $f^2$ is also Riemann-Stieltjes integrable with respect to $\alpha$ on $[a, b]$. We will now use this important theorem to show that if $f$ and $g$ are both functions defined on $[a, b]$, $\alpha$ is increasing on $[a, b]$, and $f$ and $g$ are Riemann-Stieltjes integrable with respect to $\alpha$ on $[a, b]$ then their product $fg$ is also Riemann-Stieltjes integrable with respect to $\alpha$ on $[a, b]$. Theorem 1: Let $f$ and $g$ both be functions defined on $[a, b]$ and let $\alpha$ be an increasing function on $[a, b]$. 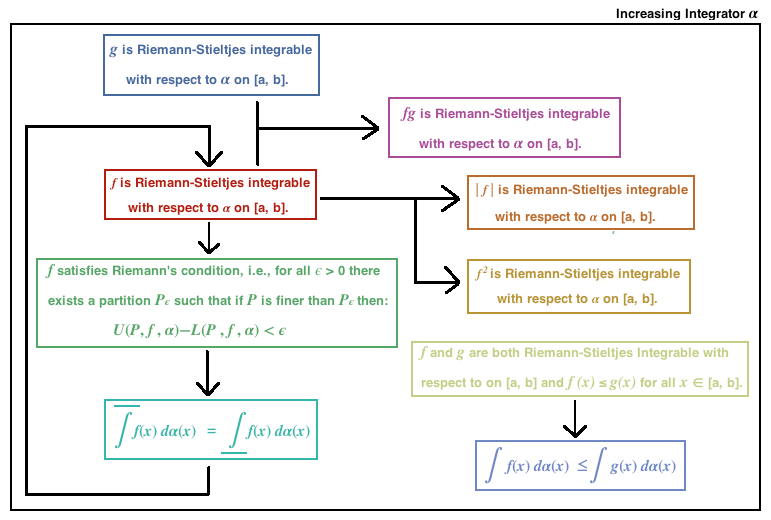 If $f$ and $g$ are Riemann-Stieltjes integrable with respect to $\alpha$ on $[a, b]$ then $fg$ is also Riemann-Stieltjes integrable with respect to $\alpha$ on $[a, b]$. Since $f$ is Riemann-Stieltjes integrable with respect to $\alpha$ on $[a, b]$ we have that $\int_a^b [f(x)]^2 \: d \alpha (x)$ exists. Similarly, since $g$ is Riemann-Stieltjes integrable with respect to $\alpha$ on $[a, b]$ we have that $\int_a^b [g(x)]^2 \: d \alpha (x)$. Furthermore, from the Linearity of the Integrand of Riemann-Stieltjes Integrals page we see that the sum $f + g$ is Riemann-Stieltjes integrable with respect to $\alpha$ on $[a, b]$, so $(f + g)^2$ is Riemann-Stieltjes integrable with respect to $\alpha$ on $[a, b]$.